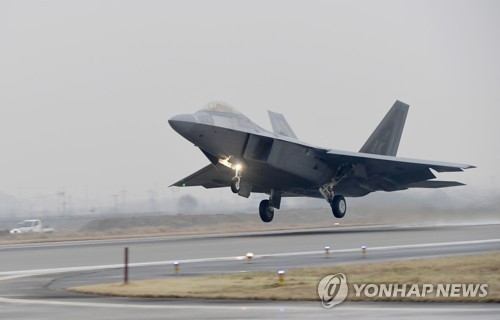 SEOUL, Dec. 4 (Yonhap) -- South Korea and the United States kicked off a major air force exercise here Monday against North Korea's threats, with two dozen U.S. stealth jets mobilized. The five-day Vigilant ACE (air combat exercise) comes less than a week after the North fired a new intercontinental ballistic missile (ICBM) and declared the completion of its "nuclear force." The annual training has drawn keen media attention, although it was scheduled before the provocation. It's known as the largest-ever combined air force drill between the allies, involving more than 230 warplanes and around 12,000 personnel. They include six F-22 Raptors and six F-35As, which have been deployed temporarily to Korea for the practice. It marks the first time that six Raptors, not just a few, have joined an exercise simultaneously in Korea. A dozen F-35Bs operated by the U.S. Marine Corps will take part in the training, flying from their base in Japan. Other assets include two B-1B Lancer bombers, six EA-18G Growler electronic warfare jets, and dozens of F-15C and F-16 fighter jets. South Korea has fielded F-15K, KF-16, FA-50 and F-5 fighters, as well as other planes. "It's aimed at enhancing the all-weather, day and night combined air power operation capabilities of South Korea and the U.S.," South Korea's defense ministry said. The allies will conduct the drills under various wartime scenarios, including simulated precision strikes on mock North Korean nuclear and missile targets, it added. The U.S. Seventh Air Force said, "The realistic air combat exercise is designed to enhance interoperability between U.S. and Republic of Korea forces, and increase the combat effectiveness of both nations."